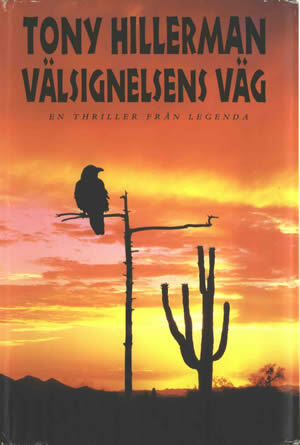 This is the Swedish hardcover edition of Tony Hillerman's first novel, The Blessing Way. The Swedish translation is by Lena Schultz, and it was published by Legenda (Bokförlaget Natur och Kultur) in 1996 in Stockholm. This is a hardcover book with a dust jacket. The cover credit is to Olle Frankzén. The front cover is a full photograph in shades of red, yellow, and black. In silhouette, a dead tree with a crow perched on a branch, and a mature saguaro cactus, stand out against a low mountain skyline at sunset. The author's name, book title, and "En Thriller Fran Legenda" are printed at the top of the cover in black. The back cover is white with the novel synopsis printed in black. The publisher's logo and book bar code are at the bottom of the back cover. On the front dust jacket fold-out is a photograph and biography of Tony Hillerman. The back fold-out is blank. The inside front and inside back covers are blank, and the endpapers are white. Binding: Full-bound, red cloth-covered boards. The author, title, and publisher logo are printed on the spine in black.